Sponsorships - Jason Alter Ph.D.
John Fastramp is a proud sponsor of the Northeastern University SAE Baja race team for the second consecutive year. You’ll find the John Fastramp logo on the firewall with sponsors ranging in size from small engineering firms to large companies like Bose. These intrepid student engineers design, build and travel around the country to race their amazing cars under the auspices of the Society of Automotive Engineers (SAE). I’ve driven the cars and they are a blast to race but that’s the fun part. These young men and women get to hone their engineering skills and work together as a team. As a parent of a team member, it’s been an inspiring process to observe the professional conference calls, the hard work and long hours and the dedication and passion of these enterprising engineering students! 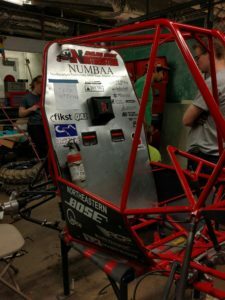 In 2017, The Northeastern Baja team traveled to Kansas, Illinois. On May 30th, 2018 they will compete in Portland, Oregon. From the official page of Baja SAE, a program of SAE International. 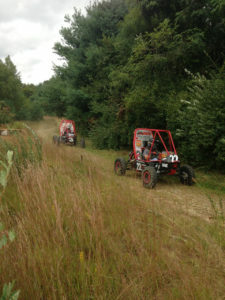 “Baja SAE challenges engineering students to design and build an off-road vehicle that will survive the severe punishment of rough terrain and in some competitions, water. As in real work situations, these future engineers work together as a team to discover and resolve technical challenges in design, test, and manufacturing, as well as business issues. 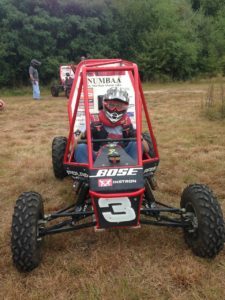 The most rugged of all the competitions, Baja SAE also gives students the first-hand challenge of pursuing their passion while managing real-life demands and priorities. Each team’s goal is to design and build a prototype of an all-weather, rugged, single-seat, off-road recreational vehicle intended for sale to the non-professional weekend off-road enthusiast. SAE International is a global association committed to being the ultimate knowledge source for the engineering profession. By uniting more than 145,000 engineers and technical experts, we drive knowledge and expertise across a broad spectrum of industries.